Lincoln Fencing Club coaches are among the top-rated fencers in the Midwest. They all have trained under talented coaches and volunteer their time to teach others how to fence and compete. The LFC coaches are invaluable! 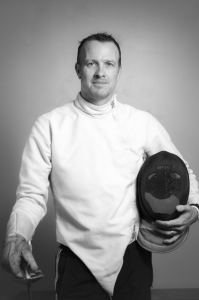 Brad Tucker, who focuses on épée, has been fencing for almost twenty years. He likes the challenge of fencing, the camaraderie, the workout, and—most of all—the competition. As a coach, he loves helping others and seeing them improve. Brad works for the Nebraska Department of Roads, and in addition to fencing, he enjoys hunting and fishing. Kit Boesch fences foil and saber. 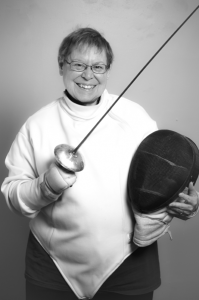 She says she has been fencing for too many years to count and loves fencing because it’s challenging and promotes physical health. Even more importantly, it gives her a chance to meet fantastic people and see young fencers grow. When she’s not fencing, Kit enjoys messing around with a guitar, reading, writing, and staying involved in a few special political issues. She’s also an avid Green Bay Packers fan. Cassidy Kovanda fences épée. He’s been fencing for twenty-three years and loves the speed, finesse, and strategy of the sport. He also likes that it rewards creativity and split-second problem solving. Cassidy is a concept artist at a creative agency called Archrival, where he does work for companies like Adidas and Red Bull. 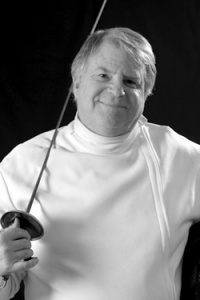 Michael Hoff, a foil fencer, first started fencing in college decades ago and has enjoyed the sport ever since. Michael is a professor at the University of Nebraska-Lincoln, where he specializes in Greek and Roman archaeology (which is why he is never in Lincoln from June through August, as he is excavating lost Roman cities). 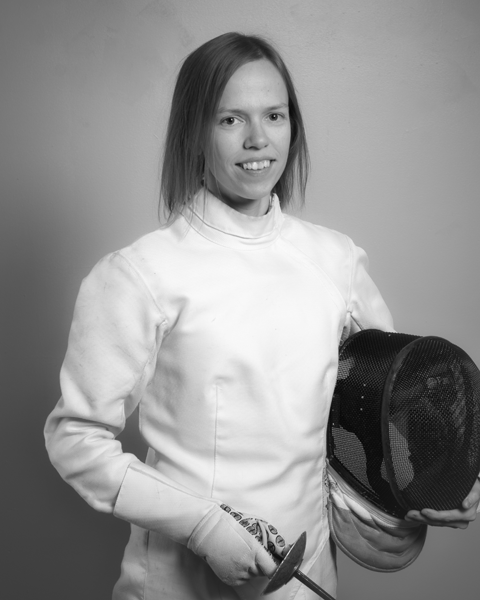 Amanda Bush is a foil fencer and has fenced for twenty years on and off. 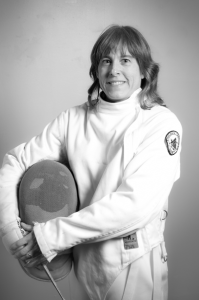 She started fencing because it was a unique sport. These days, she enjoys the intense physical workout; the stress relief of fencing her heart out on the strip; and the supportive, familial camaraderie of Lincoln Fencing Club. Amanda works at a local nonprofit in downtown Lincoln. She enjoys coffee; crocheting; and having adventures with her husband, Joshua, and their two children, Fredric and Irina. Joshua Bush fences saber and épée. 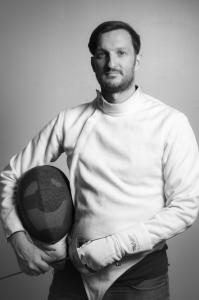 He has been fencing for more than twenty years and likes that fencing incorporates a highly technical, classical, and historically savage combat art into one of the safest and most exciting sports. He also loves that fencing is a lifelong pursuit: a fencer can begin competing at eight years old and continue to compete even at an international level well into his or her twilight years. When he’s not fencing, Joshua enjoys hunting, fishing, scuba diving, and gunsmithing. 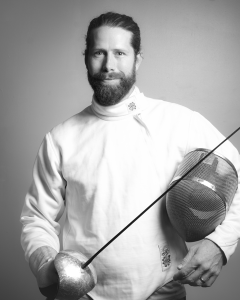 Tim Marcuson primarily fences épée. 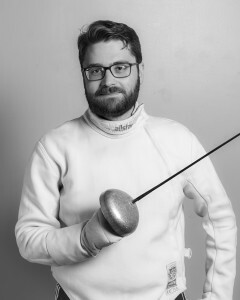 He started fencing about twenty years ago, took a break for college and graduate school, and came back to the sport as an adult. 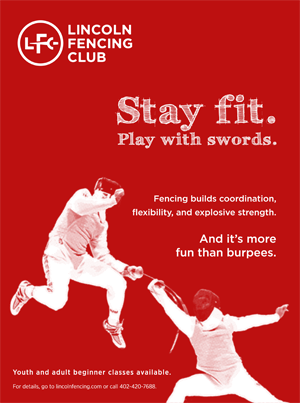 He loves fencing for its tactical complexity, competitiveness, and physical challenge. Tim works as a freelance editor, and his hobbies (in addition to fencing) include writing, playing computer games, fishing, and cooking. 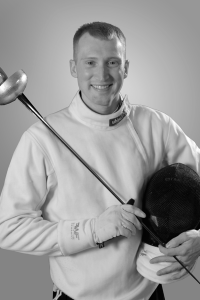 Kristian Anderson, a foil fencer, also enjoys saber. He has been fencing for twenty-four years. He says that fencing is part of his soul; he loves it more than chocolate. Kristian owns his own company and does graphic design, web design, and video production. He also teaches as an adjunct at the University of Nebraska teaching photography and videography. He enjoys spending time with his five children and his wife, Laura. 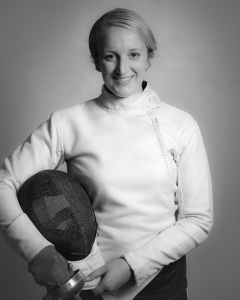 Sallie Dietrich, an épée fencer, has been involved in the sport for sixteen years. She loves to fence because it’s both physical and technical and because there’s always more to learn. When she’s not fencing or at work, she’s usually on a running trail, lifting weights, or hanging out at home with her husband and two furry dogs.